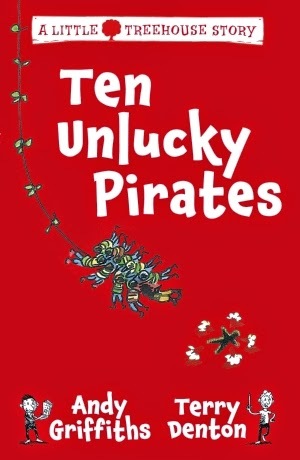 The ten unlucky pirates depicted in this book with the same title come from the 26-Storey Treehouse. Counting backwards from ten each pirate meets an unlikely end. What goes on between ten and none is a set of disasters. Whether the pirates are swinging on a vine, learning to skate, riding a mechanical bull, getting a tattoo or any other of their bizarre activities, one always goes down. Their antics are daring, for they are fearless pirates. This doesn’t stop them from disappearing. Another highly entertaining book for beginner readers, the focus on numerical exercises while the pirates reduce in number.